instillation five time faster than conventional roof systems. 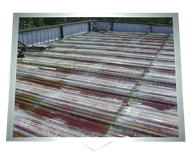 We power wash and clean your existing roof system and apply a primer as needed. The Liquid rubber coating is applied using a specially designed hose and pump system. The Coating System is a spray applied Liquid rubber product. It is comprised of a part A and a part B product. The two products are heated and pumped through specially designed hose and pump system, which mixes the product to an 8 to 1 ratio. The mixture is then spray applied through a wand at 200 to 4000 psi. Since it is a liquid at this point, it is self leveling, filling all cracks and crevices, including hard to read areas under and around HVAC units and flashing. 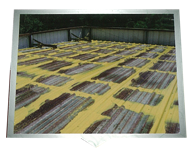 It’s special formula forms a molecular bond, which will adhere to almost any surface, giving you a seamless roof system. 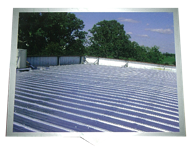 Our special system has a drying time of five minutes at 70 degrees ambient temperature. This product will not diminish in thickness when dry (i.e. if the product goes down at 48- mil thickness wet, it will be 48 mil when it dries.) This primary coat has a 200+% elongation with 100% memory. Basically, it will stretch and will not split when the roof expands and contracts as the roof cool and contracts. These qualities do not diminish with age. Next, the top coat is roller applied. This product provides UV protection for the rubber, it is 87% reflective initially, and keeps 84% after three years. It is a polyglycol rubber component. It gets it’s pigmentation from ground aluminum . This is approximately 30% of it’s makeup and results in an highly reflective roof system utilizing a prism effect. It is not paint! This highly reflective top coat will deliver at least and over all 15% to 20% energy saving on climate controlled facilities. In some cases it as delivered even more!